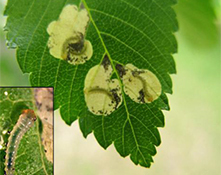 The Elm Leafminer attacks Scotch, Camperdown, English and American Elm trees. Young larvae begin to make their blotch like mines in the leaves. The mines first appear as tiny whitish spots. The larvae confine their feeding to the area between the leaf’s lateral veins and eat the green tissue between the two layers of epidermis. Several mines may coalesce to form large blotches. Damaged leaves may remain on the tree throughout the growing season. Injured areas in the leaves turn brown and eventually drop out, leaving irregular holes. Such injury spoils the appearance of ornamental trees and reduces the tree’s vigor and growth. The adult insect is a black sawfly about 3mm long and can usually been seen flying around its food source in May. It lays eggs in the leaf tissues through slits the insect cuts with its sawlike ovipositor in the leaf’s upper epidermis. In about 1 week the eggs hatch and the young larvae begin to feed. The larva completes its development in late spring, cuts a hole through the epidermis, drops to the ground and burrows into the soil to a depth of nearly 25 mm. It then prepares and lives in its papery cocoon throughout the summer, fall and winter. One generation occurs each year. 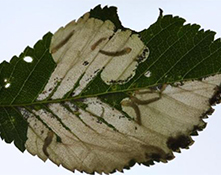 Treat foliage around late May to early June to control larvae as mines first become apparent. 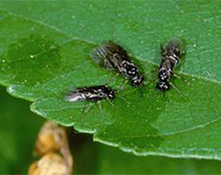 For small infestations, mined leaves can be picked off and destroyed.